Curiosity about the new movie Rosewater stems in part from its pedigree. Rosewater, which tells the story of a journalist who was imprisoned and tortured in Iran, marks the directorial debut of comic Jon Stewart. No stranger to political commentary, Stewart drops his satirical edge, building his movie from quiet outrage about what happens when free expression is trampled and ideology replaces sanity. Rosewater attacks this larger theme by focusing on the story of Maziar Bahari, an Iranian/Canadian journalist whose book, Then They Came for Me, became the bestseller that provided a basis for Stewart’s movie. Bahari’s journey began with an assignment for Newsweek: When we meet him, he’s covering the election between hardliner Mahmoud Ahmadinejad and Mir Hossein Mousavi, the candidate who promised sweeping reforms. In need of transportation, Bahari (Gael Garcia Bernal) quickly establishes a relationship with a cab driver (Dimitri Leonidas) who subsequently introduces him to a group of reform-minded young people who believe Iran is on the brink of revolutionary change. Their enthusiasm is infectious; they can’t wait for a new day. It never dawned. Ahmadinejad won. The country’s opposition claimed election fraud and protests broke out. The fact that Bahari filmed a protest in which soldiers fired on protesters helped seal his fate. He was arrested and accused of being a spy. In 2009, Bahari spent 118 days in prison. Once in Evin Prison, Bahari underwent interrogation, beatings and psychological torture, mostly (according to the movie) at the hands of one man (Kim Bodnia), an official who’s eager to please his superiors by eliciting a confession from Bahari. Bernal presents Bahari as a young journalist who can’t quite believe that he’s been caught in a position in which he must accept a reality that, to him, seems entirely absurd. At various points during his ordeal, he weakens. 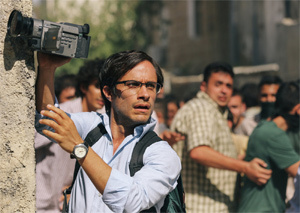 Stewart, who filmed Rosewater in Jordan, uses real news footage to heighten the film’s sense of immediacy and to give it breadth, but for the most part, Rosewater is a closed-in drama. We follow Bahari as he moves from his spartan cell to the interrogation room, where he’s often blindfolded. Perhaps to open things up a bit, Stewart also includes scenes in which Bahari imagines that he’s talking to his late father (Haluk Bilginer), a man who served time in the same prison during the Shah’s repressive regime. These fantasy conversations help Bahari build strength for his ordeal. Shohreh Aghdashloo plays Bahari’s mother, and Claire Foy portrays his London-based, pregnant wife, but the central drama hinges on the relationship between Bahari and a tormenter who isn’t always sure of himself and who, on at least one occasion, finds himself at odds with his boss. Bahari calls his interrogator Rosewater because the man has a habit of sprinkling himself with cologne. The film finds a brief touch of wit when Bahari tells his captor about the degenerate ways of the West, putting the man in the delicate position of wanting to hear more about the sexual decadence he’s pledged to combat. As Bahari fictionalizes about various forms of massage, he’s provided with a rare — if fleeting — opportunity to exercise a measure of control over his tormenter. Stewart’s interest in the story stems from the fact that an appearance Bahari made on The Daily Show was part of the evidence used against him. Bahari was interviewed in Tehran by comic Jason Jones for a satirical Daily Show segment in which Jones posed as a spy. International attention helped free Bahari, whose story may constitute only a footnote in the overall sweep of global oppression, but Stewart tells Bahari’s story with urgency and authenticity. In the process, he reminds us of what can happen when literalists take command of a culture; i.e., nothing good.